Al Ha’Nisim is a short prayer of thanksgiving that is meant to express God’s role in the miracle of Hanukkah. This year, HIAS invites you to include a creative Al Ha’Nisim that speaks of the miraculous triumph of some of the world’s 65 million refugees and displaced people over the tragic circumstances they have faced. 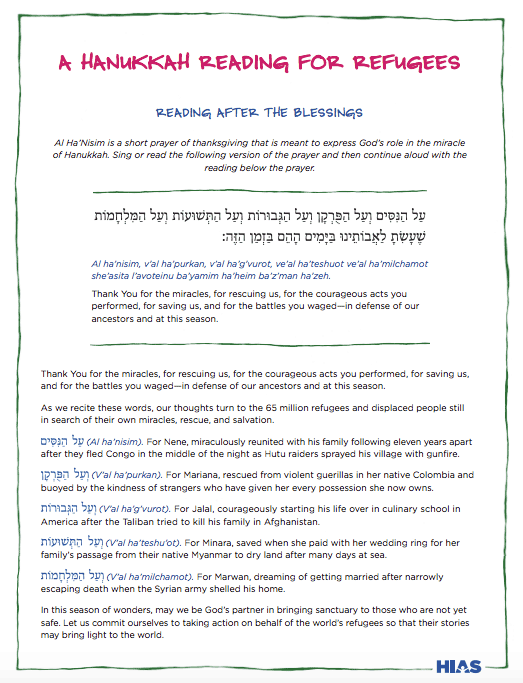 Below you will find a 2-page PDF that contains the traditional blessings over the Hanukkah lights on the first page, followed by a creative Al Ha’Nisim reading on the second page.